Paul Lessingham is a celebrated politician in Victorian England, a great reformer turning his exceptional rhetorical skills to the promotion of the common good against entrenched aristocratic interests. But Paul Lessingham has a secret in his past – a secret relating to a hidden cult of Isis out in Egypt whose priestesses are somehow simultaneously human beings with intense hypnotic powers and sinister, oversized scarabs. One such priestess has come to London to exact revenge for the cult. The story of this brutal campaign of terror is narrated by four different sources. There’s Robert Holt, a clerk fallen on hard times who falls under the priestess’s hypnotic coercion. There’s Sydney Atherton, a mercurial inventor whose puttering about in his home laboratory developing weapons of mass destruction is disturbed both by Lessingham’s troubles and his unrequited love for Lessingham’s fiancée. There’s Marjorie Lindon, the fiancée herself, who’s not up for being frozen out of the investigation. And there’s Augustus Champnell, who makes his living tidying away the skeletons in upper class types’ closets. 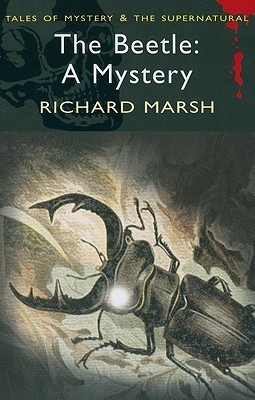 All of them offer part of the picture, but can any of them fully unravel the enigma that is… The Beetle?? ?